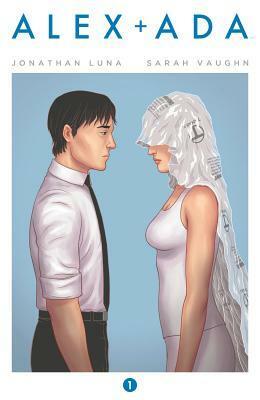 Alex + Ada is a graphic novel that is set in a world where humans and androids coexist. While humans are trying to maintain the upperhand by using the robots as servants or companions, the Nexaware Massacre drives them to the extremes and they establish the A.I Restrictions Act. Alex, suffering from a breakup, is appalled when his grandmother sends him a Tenaka X5 android. After a lot of consideration, Alex decides to keep her and names her Ada. But soon, he grows frustrated with her inability to make choices by herself and her lack of individuality. This lands him on a rocky terrain filled with illegal intrigue and a companion who barely knows anything about herself. I’ve been meaning to read this graphic novel for a long time and it has received a lot of good reviews on Booktube as well as Goodreads. The 1st issue was good but not great because it had a large chunk of technological information which in a way is necessary in order to set the foundation to the story. I did enjoy it. Alex’s grandmother is hilarious. Which sort of balanced out his glum mood. From the 2nd issue onwards, it gets progressively great. The story builds up and is played out at a good pace. I was glued to the novel and couldn’t stop reading it. The art work in the entire volume is splendid. It is not very colorful and yet the themes followed in a particular page gel together seamlessly. Alex’s friends didn’t seem all that surprised at seeing Ada. That reflects how normal it is, in the society, to have an Android at home. I agree with a point that has been put across in the novel, which is that – humans want to A.I in order to make their lives easier, and then they are fed up of how “robotic” and “not human” these androids are. That idea conveys the double standards, that humans have, very accurately. One other thing that I really really liked about this novel is the space that has been created by the authors called Prime Space. It is a virtual reality that humans and androids can enter into and explore all sorts of places, games, forums etc. You’d be able to understand better if you read the graphic novel, which I suggest you do. Because it is so so good. I would definitely recommend it to all who like scifi. The plot is great, the art is wonderful. What’s not to like? One of the most popular Gothic classics, Dr Jekyll & Mr. Hyde sets the mark for numerous psychological and literary studies. 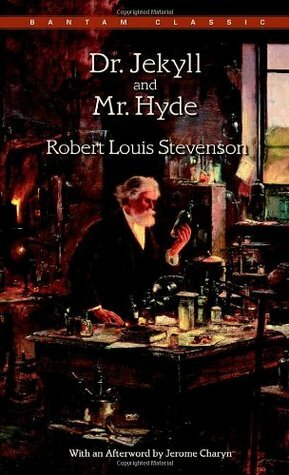 It is the story of a certain Mr. Hyde, cold and villainous who surfaces as a relative of the kind Dr. Jekyll, scientist extraordinaire. When two old friends of Dr. Jekyll’s – Mr. Utterson and Dr. Lanyon – notice this absurd shift in the scientist’s demeanor, they take it upon themselves to solve the surrounding mystery about the newfound connection. Mr. Hyde’s appearance is marked by Dr. Jekyll’s tendency to become a recluse and maintain a distance from the public. This puzzling hide and seek of the two has Mr. Utterson completely befuddled. And what comes to his understanding makes the two friends wonder how Dr. Jekyll could have ventured into such uncharted territories. A truly classic book, The Strange Case of Dr. Jekyll & Mr. Hyde maintains its air of suspense from the very beginning. The dark and chilling atmosphere of the plot is reflected in the clime of its setting. The plot is splendid and thrilling. I would have rated the book higher if some of the content was more decipherable. At some instances I couldn’t understand what was going on. As in the author’s writing style was a little overwhelming at times. Dr. Jekyll is portrayed to be the responsible, amiable and skillful individual whereas Mr. Hyde is the exact opposite. He has no remorse for his actions, is very antisocial and not kind. I was aware that the book had something to do with split personalities but fortunately I hadn’t been spoiled with the details and so the climax did come off as a shock to me. I felt that while it was representative of the dual nature of man, this form of escapism was totally unnecessary. I understand that Dr. Jekyll, tired of always being the good guy, wanted to explore the other side for a change. But he didn’t have to invest in such a risky endeavor because that is playing with one’s life and not appreciating it as much as he ought. We all at times reach a point where our personalities change due to circumstances but I don’t believe that such a drastic change is needed to balance out the good and the bad within us. A must read classic of the epistolary kind, this book envelopes you with its stunningly eerie tone and ending. Ratings – 3 stars on 5. Titu Mir, son of a farmer Nisar Ali is a righteous and willful lad. Since childhood, he has been running wild, helping others with no regard for the danger it might put him in. His family’s expectations of him carrying forward his father’s legacy are crushed when he chooses another life path. Titu goes on to become the voice of the poor folk in Bengal during the time of the British Raj. His valiance exudes the motivation needed to urge the farmers and vendors to take a stand. Soon his sons, brothers, nephew and friends joins him in this patriotic cause. He gathers courageous men from different communities and trains an army to revolt against the corrupt landlords and British authorities. Many planters, landowners and goons stand in his way, underestimating the strength of a lathi-wielding vigilante. They learn their mistakes the hard way. Mahasweta Devi captivates us with this historical tale about Bengal, the riots, the peasant community and the diktats of the British. The setting of the plot is mostly rural Bengal and focuses on those subjugated by the Britishers. I found it a little difficult to keep track of the multiple villages and towns that were featured in the book. Nevertheless, the story is easy enough to understand. The unfair settlement laws held in place are upturned when Titu Mir takes matters into his own hands. Titu Mir has a family of his own, whom he leaves quite often to train individuals, meet allies, procure necessities etc. It is understandable that a soldier of the nation makes tons of compromises, so expecting him to devote time to his family would be a little unreasonable. The first few chapters involves major time leaps. 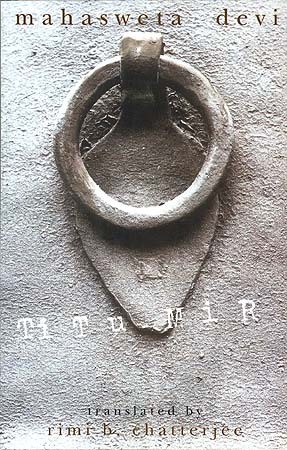 We read about Titu as a kid and soon after as a teenager and then as an adult. There were many people who were instrumental to his achievements. Something I found to be enlightening about this book is that it clears certain misconceived perceptions about Muslims which gets added to, by the enemies, to portray the Muslims as being aggressive and against other religions. Which is far from true. This book offers a lot of detailed information but not so much so that it becomes a history textbook. It addresses social concerns like oppression, vandalism, theft, arson. The story pulls you in and instills in you a sense of nationalism. I loved the book so much. It is a fulfilling account of the Wahabi Movement and how our countrymen dealt with the British. MUST MUST READ! Candide overwhelmed by the words of his mentor Pangloss, gets swept up in a chain of events which ultimately result in a constant shift of landscapes, as he moves from one place to another in search of his loved ones. Having absorbed the notion of cause and effect, he rationalizes all the happenings around him to the way of nature. Instead of succumbing to grief or fury, he pacifies himself with the thought that all that happens does so for a reason. In this elaborate journey, he meets new people and has various eye-opening experiences. He and his companions are at times driven away, face death threats or are received with the greatest regard and bidden farewell to with bags of jewels. Voltaire has put together this story of Candide whose love for Cunegonde takes him places he normally wouldn’t have known much of. A quick read of a hundred pages or so, the book packs so many instances that are odd and not really predictable. Right from encountering a city where precious jewels are considered rubble to witnessing the hanging of a loved one. Candide’s mentor and philosopher Pangloss has educated him since long to believe that everything that happens is for the best. But when he tries to equate multiple social evils to being “for the best”, it was a little irksome. There is optimism and there is illogical thinking. Many sections of the book seemed to blur the line between the two. There are many characters in the book who have brief roles to play. Some surface from time to time, others are lost in the past. There was some unnecessary violence too in the book which makes you question the nature of the character who initiates it. The book also points to the structure of society as was in Europe during the 18th century. Even though women weren’t as high up in social ranking as men, Voltaire hands a different kind of authority to some of the female characters of the plot, who in their own way climb up the pedestal. 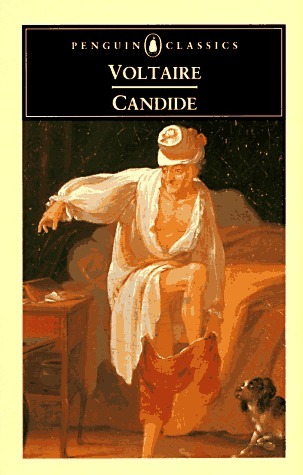 Candide’s love for Cunegonde, though a kind of instant-love, is emphasized throughout the book. Wherever he goes, he is always calling out to his beloved to wait for him. But just when you’d think they could be together, his conviction falls flat. And again we wonder how true Candide’s sentiments were. 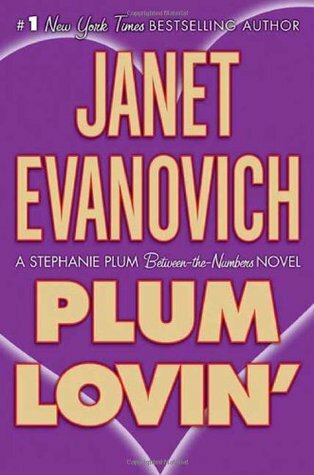 For a classic read, this book is bizarre and yet enjoyable. Worth knowing what the deal is. Phileas Fogg is an extraordinary man. He is rarely daunted by the potholes in his way and equipped with a steadfast determination, attains what he so wishes. During a game of whist, a casual conversation turns to a challenge which sends Mr. Fogg on an adventure around the world within eighty days. Needless to say, his carefully planned trip doesn’t come to pass without trouble. A grave misunderstanding and treacherous weathers question the probability of him winning the wager. 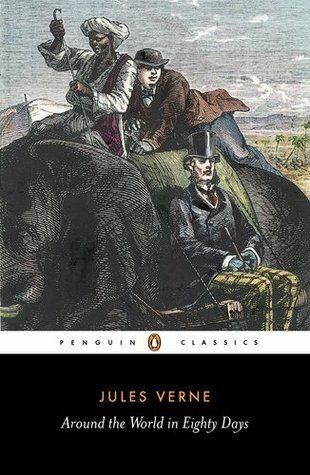 Around The World in Eighty Days is a quick, delightful read of Mr. Fogg and his companion’s experiences in changing regions and clime. There appears to be many editions of this text, and I happened to pick a short abridged version. Usually I wouldn’t read abridged versions of classics but keeping in mind, the plot of this novel, I feel that the 120 paged edition was more appropriate and not draggy. It is fun enough that you are constantly wondering if Mr. Fogg’s overconfidence would cost him dearly. Afterall twenty thousand pounds for a bet is far too much. The protagonist is shown to be extremely stiff, lacking the expression of basic emotions which make us human. He seems not only detached from his surroundings but also very mechanical in his mien. Along the way, he makes certain acquaintances who stick with him till the end. Its a wonder how they dealt with his personality. His relationship with one such acquaintance, his counterpart to be precise, sounded flaky, perhaps because of the absence of any history or sound reason. Passepartout, his servant, is a fickle character, who only comes to his senses towards the end. There are a few cultural references (of India) that I found easier to understand. The end was fitting to some extent, not very apparent/obvious hence a good way to wrap up the text. The writing too was good, characteristic of classics. I enjoyed it but didn’t absolutely love it. Will definitely try something else by Jules Verne. Thank you Bloomsbury India for sending a copy of this book for review. In this epistolary novel, Leah Thomas pens down a friendship so rare; a sense of optimism seldom seen through the characters of Oliver Paulot and Moritz Faber. Each a vital component of this touching narrative, teach us that sometimes youngsters can be a lot more mature than they are given credit for. Oliver is allergic to electricity and has epilepsy. He lives far from civilization, cocooned in a no-electricity zone with his mother. On the other hand, Moritz was born without eyes and uses a pacemaker to stabilize his heart. Through letters, they become the best of friends; becoming a sort of life jacket for each other. Except for one misfortune – neither can meet face to face for that would mean the end of one. Oliver and Moritz have always yearned for a shot at normalcy and to discover their apparently common history. With the help of loved ones, they strive to get there. 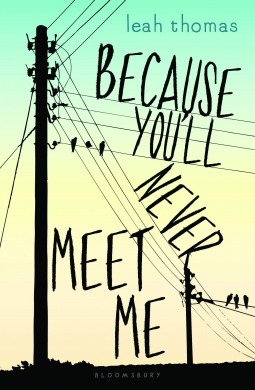 But sometimes life gets too overwhelming when bullies, loneliness, love and suppression get the best of the two boys. Because You’ll Never Meet Me is not just the sun shining through the storm, it is a flag of strength and endurance. Its been long since I enjoyed every page of a book from to start to finish. This novel is so captivating with its innocence and beautiful writing that it will for long be a standard of YA epistolary fiction for me. Oliver for most of the book is a very cheerful, buoyant character who urges Moritz to be strong and dauntless. Moritz initially is a very rigid, serious person who doesn’t appreciate Oliver’s forward nature. But slowly as they share their woes with each other and learn to be a “kickstand”, both of them grow to become more satisfied and happy. Dual narration is not an easy writing technique and Leah Thomas has done a commendable job of bringing out the perspectives of two very different individuals in her novel. I absolutely love her writing style, which is very fluid and simple. Not too many complexities and such. There is also a mysterious air in the novel, as Oliver wishes to know about his father and similarly Moritz about his mother. This suspense, however, does not intervene in the process of creating a very contemporary setting for the novel. Liz, Oliver’s neighbour is a spirited girl who shows Oliver that not everyone sees him as a “freak” and ultimately he starts liking her. But I really didn’t like Liz’s character and many a times, she seemed shallow. Moritz too gets his heart set on someone and I definitely cheered them on. The plot, the characters, the writing all come together to give life to this wonderful story. BYNMM deserves more than a five star rating, it deserves to be read over again – because its just that amazing! Please please give this book a try, you most certainly won’t regret it. Its almost 2 months until NaNoWriMo begins and I am already itching to start typing. This time for a change, I will be ready beforehand with everything I need so by October end, I would be saving up all my creativity just for the novel. Last year, even though it was my first try, I did win, but I wasn’t so happy with how the story progressed. 1. Think of a theme for your story. Once that has been decided, try to make it more specific by eliminating sub themes. You could always have more than one, which I think if you balance it out, will be really interesting to read. 2. Establish what happens initially and what you want to happen at the end. Sometimes if you have a pre decided ending, it becomes difficult to arrive there so throughout Nov, keep that ending in mind. You will be able to “make ends meet”. 3. Work on possible titles. It’s always good to keep a couple of titles ready in case one doesn’t work out later, you always have back ups (atleast ones that you like). The title apart from the cover is another thing that grabs attention so try to make it such that it tickles your readers’ curious bone. 4. Write down a short para of about 12-20 lines that perfectly sums up your entire novel. Since we aren’t deciding every detail in the novel before, the synopsis is likely to change towards the end, to accommodate more important events. Nevertheless, keep it ready so your last minute work is cut down for you. Also you want to touch upon the problem that your character is facing or the event that leads to the climax. 5. Cover page. Now the cover of the book isn’t that serious of an issue, mostly because if you are writing the novel as a hobby and don’t intend to publish it anywhere (print or online) then there’s no need to focus a lot on the cover in the prep phase. But if you’d like to have it ready, either start sketching the important elements in your story or have someone else do it. Cause whatever is displayed on the cover should have some symbolic meaning to what is inside. 6. Lastly, have an idea about the character personalities and a basic outline for the sections of your novel. And by sections I mean, how your plot and characters will be introduced in the first 5 chapters; how the problems or twists affect the protagonist and others; what events/development of the action will lead to the climax; and finally the results of the climax which gives you your ending. You could write it down, if you have a solid plan or just keep a vague idea in mind. So there is tons to do before November. I have sort of started working on some of the above steps. And I plan to finish most, if not all. Can’t wait! So as many of you may or may not know, I took part in NaNoWriMo 2013. To record an entire month’s worth of happenings and pen down my feelings at various stages wouldn’t be easy in one post, so I have decided to do a series post. Not only will I forever be able to cherish this experience but some of you who haven’t participated in NaNo before and are hoping to try next year, may find these posts useful. In this post I am going to talk about the pre-NaNo prep. I am a person who prefers doing thorough research before I get into a task. As of October 28th I knew what my story was going to be like. I had a beginning and an ending in mind, not much to fill the gaps in between though. I signed up and found out that many people had already created a title, a book cover, a synopsis and so. It was reason enough to panic, but I suppressed my anxiety and got down to perfecting my synopsis. I found little comfort in posts put up by others that said “it’s not a problem if you don’t have cover in the beginning”. It was a problem for me. A big one at that. Being a perfectionist doesn’t come easy. There were people with fancy covers a week before NaNo started. I had to have one! Immediately I picked a NaNo Artisan who was offering to do covers for free. In a matter of time I had somebody working on mine. I was to get it by first week of November. How wonderful! The synopsis didn’t take that much time and with a lot of assurances from my friends and family, I was ready with a somewhat reasonably good synopsis. Only if the title were so easy to come up with. I still remember how tormented I had gotten over deciding the title. My mind went blank and stayed that way for hours. Not to scare you, but while you decide the theme or storyline, you might want to keep some keywords in mind, to help you with the title. I hadn’t thought of that and I blindly went ahead and wrote my synopsis after much speculation. Now ofcourse I wasn’t going to alter my synopsis to suit the title, but with minor tweaks I had some ideas in mind. Mid November I started realizing how unprepared I really was. I hadn’t made an outline of the novel for starters. You may think of it as unnecessary. I did too but I wasted a lot of time because of that misconception. Unless you have prior experience at novel writing and/or you are an exceptionally imaginative person, please please do make an outline of your novel before Nov. It’s not cheating as long as you only jot down some words concerning each chapter of your novel. The problem with not making the outline is that there is no fixed track. You start out with what you had in mind, then you go with the flow and write on the spot. But when there are no set boundaries, there is a tendency for the story to drag and be all over the place. It becomes difficult to end it in the way you thought and in time for the due date. Because I hadn’t made an outline, I ended up taking more time to think of my next sentence than I did writing in a day. Also I had to add a lot more twists and turns to keep the story afloat. If only I had decided what was to happen in each chap, I feel my novel would be more balanced and better paced. So preparing in advance is a life saver. DO NOT NEGLECT the preparation stage. And certainly DO NO WHILE AWAY the last few days of October. They come in handy..